Jasmin has almost finished the 3 color cashmere cowl. She is very excited about wearing it. Gigi seems to be on a sock knitting kick, she has started a new pair of Vanilla socks out of Opal, and finished two pairs and worn them. She also has cast on another pair. 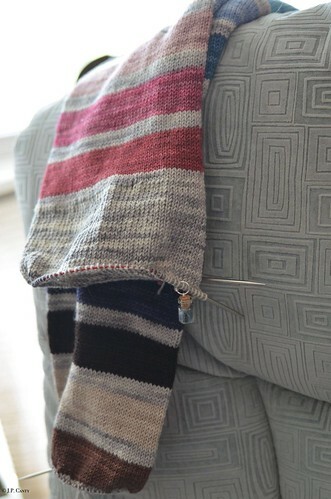 Jasmin did some surgery on her Striped Cowl, and picked up stitches and is making it eight inches longer. Gigi is working on more socks. Also, she has mostly bound off her 1000 Tulips shawl. Jasmin is working on her circular sock machine hybrid socks, out of Voolenwine's Footsie base. This is the NZAK Quick Knitter. She is winding yarn on cones for smooth knitting. And she is very pleased with the hand of this yarn. Gigi is still working on the beaded mesh part of the Viajante. It is coming along slowly. Congratulations to CommuterJen, on the birth of her twin daughters. Gigi has been listening to the Knit Girllls and other podcasters about this being the year of learning a new skill. She is thinking about maybe learning to do colorwork. Double Knitting? Fair Isle? Jasmin is evangelical about blocking knits, and thinks the difference of blocked vs unblocked is noticeable. Gigi has worn some wool socks. about what to do with handmade things that have been outgrown. Jasmin did not pay attention to the ribbing on the cowl and managed to mess up a k1p1 ribbing. She also had a sock machine knitting attack. Gigi knitted the waste yarn for the heel backwards into the sock, and left it in, and when she came back to pick up the stitches, found it incredibly easy to pick up stitches. So she declared that she unvented an easier way to pick up stitches. This week we purloin "Shenanigans", from "The Fat Squirrel Speaks" and share woes of the water heater. Jasmin also mentions that Prairie Girls Knit and Spin always cheer her up. This week we review New Directions in Sock Knitting, by Ann Budd. We mention the lovely Anne Berk, of AnneTarsia. Gigi did a spot of mending, fixing a loop on a neck tie. I plan to knit one in time for next fall. Can't wait to have it! It was designed by a local Michigan designer. Honestly, the pictures on projects don't do it justice. I've seen several of them out in the wild, and the sample in the Woven Art yarn shop in East Lansing, Michigan, and they are all gorgeous!